Uranium ore deposits are economically recoverable concentrations of uranium within the Earth's crust. Uranium is one of the more common elements in the Earth's crust, being 40 times more common than silver and 500 times more common than gold. It can be found almost everywhere in rock, soil, rivers, and oceans. The challenge is to find those areas where the concentrations are adequate to form an economically viable deposit. Globally, the distribution of uranium ore deposits is widespread on all continents, with the largest deposits found in Australia, Kazakhstan, and Canada. To date, high-grade deposits are only found in the Athabasca Basin region of Canada. Uranium is generally used to generate nuclear fuel. Uranium deposits are generally classified based on host rocks, structural setting, and mineralogy of the deposit. The most widely used classification scheme was developed by the International Atomic Energy Agency (IAEA) and subdivides deposits into 15 categories. Uranium is a silvery-gray metallic weakly radioactive chemical element. It has the chemical symbol U and atomic number 92. The most common isotopes in natural uranium are 238U (99.27%) and 235U (0.72%). All uranium isotopes present in natural uranium are radioactive and fissionable, and 235U is fissile (will support a neutron-mediated chain reaction). Uranium, thorium, and potassium are the main elements contributing to natural terrestrial radioactivity. Uranium has the highest atomic weight of the naturally occurring elements and is approximately 70% denser than lead, but not as dense as tungsten, gold, platinum, iridium, or osmium. It is always found combined with other elements. Along with all elements having atomic weights higher than that of iron, it is only naturally formed in supernova explosions. The primary uranium ore mineral is uraninite (UO2) (previously known as pitchblende). A range of other uranium minerals can be found in various deposits. 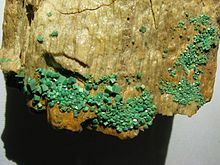 These include carnotite, tyuyamunite, torbernite and autunite. The davidite-brannerite-absite type uranium titanates, and the euxenite-fergusonite-samarskite group are other uranium minerals. A large variety of secondary uranium minerals are known, many of which are brilliantly coloured and fluorescent. The most common are gummite, autunite (with calcium), saleeite (magnesium) and torbernite (with copper); and hydrated uranium silicates such as coffinite, uranophane (with calcium) and sklodowskite (magnesium). There are several themes of uranium ore deposit formation, which are caused by geological and chemical features of rocks and the element uranium. The basic themes of uranium ore genesis are host mineralogy, reduction-oxidation potential, and porosity. Uranium is a highly soluble, as well as a radioactive, heavy metal. It can be easily dissolved, transported and precipitated within ground waters by subtle changes in oxidation conditions. Uranium also does not usually form very insoluble mineral species, which is a further factor in the wide variety of geological conditions and places in which uranium mineralization may accumulate. Uranium is an incompatible element within magmas, and as such it tends to become accumulated within highly fractionated and evolved granite melts, particularly alkaline examples. These melts tend to become highly enriched in uranium, thorium and potassium, and may in turn create internal pegmatites or hydrothermal systems into which uranium may dissolve. The International Atomic Energy Agency (IAEA) assigns uranium deposits to 15 main categories of deposit types, according to their geological setting and genesis of mineralization, arranged according to their approximate economic significance. The IAEA classification scheme works well, but is far from ideal, as it does not consider that similar processes may form many deposit types, yet in a different geological setting. The following table groups the above deposit types based on their environment of deposition. Unconformity-type uranium deposits host high grades relative to other uranium deposits and include some of the largest and richest deposits known. They occur in close proximity to major unconformities between relatively quartz-rich sandstones comprising the basal portion of relatively undeformed sedimentary basins and deformed metamorphic basement rocks. These sedimentary basins are typically of Proterozoic age, however some Phanerozoic examples exist. Phanerozoic unconformity-related deposits occur in Proterozoic metasediments below an unconformity at the base of overlying Phanerozoic sandstone. These deposits are small and low-grade (Bertholene and Aveyron deposits, in France). The two most significant areas for this style of deposit are currently the Athabasca Basin in Saskatchewan, Canada, and the McArthur Basin in the Northern Territory, Australia. The deposits of the McArthur River basin in the East Alligator Rivers region of the Northern Territory of Australia (including Jabiluka, Ranger, and Nabarlek) are below the unconformity and are at the low-grade end of the unconformity deposit range but are still high grade compared to most uranium deposit types. There has been very little exploration in Australia to locate deeply concealed deposits lying above the unconformity similar to those in Canada. 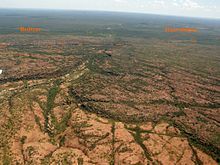 It is possible that very high grade deposits occur in the sandstones above the unconformity in the Alligator Rivers/Arnhem Land area. A uranium mine, near Moab, Utah. Note alternating red and white/green sandstone. This corresponds to oxidized and reduced conditions in groundwater redox chemistry. The rock forms in oxidizing conditions, and is then "bleached" to the white/green state when a reducing fluid passes through the rock. The reduced fluid can also carry uranium-bearing minerals. Sandstone deposits are contained within medium to coarse-grained sandstones deposited in a continental fluvial or marginal marine sedimentary environment. Impermeable shale or mudstone units are interbedded in the sedimentary sequence and often occur immediately above and below the mineralised horizon. Uranium is mobile under oxidising conditions and precipitates under reducing conditions, and thus the presence of a reducing environment is essential for the formation of uranium deposits in sandstone. Primary mineralization consists of pitchblende and coffinite, with weathering producing secondary mineralization. Sandstone deposits constitute about 18% of world uranium resources. Orebodies of this type are commonly low to medium grade (0.05–0.4% U3O8) and individual orebodies are small to medium in size (ranging up to a maximum of 50,000 t U3O8). Significant potential remains in most of these centers as well as in Australia, Mongolia, South America, and Africa. Many deposits represent combinations of these types. Tabular deposits consist of irregular tabular or elongate lenticular zones of uranium mineralisation within selectively reduced sediments. The mineralised zones are oriented parallel to the direction of groundwater flow, but on a small scale the ore zones may cut across sedimentary features of the host sandstone. Deposits of this nature commonly occur within palaeochannels cut in the underlying basement rocks. Tabular sandstone uranium deposits contains many of the highest grades of the sandstone class, however the average deposit size is very small. Roll-front uranium deposits are generally hosted within permeable and porous sandstones or conglomerates. The mechanism for deposit formation is dissolution of uranium from the formation or nearby strata and the transport of this soluble uranium into the host unit. When the fluids change redox state, generally in contact with carbon-rich organic matter, uranium precipitates to form a 'front'. The Rollfront subtype deposits typically represent the largest of the sandstone-hosted uranium deposits and one of the largest uranium deposit types with an average of 21 million lb (9,500 t) U3O8. Included in this class are the Inkai deposit in Kazakhstan and the Smith Ranch deposit in Wyoming. Probably more significant than their larger size, rollfront deposits have the advantage of being amenable to low cost in-situ leach recovery. typically the convex side points down the hydraulic gradient. the limbs or tails tend to be peneconcordant with the lithology. most ore-bodies consist of several interconnected rolls. individual roll-front deposits are quite small but collectively can extend for considerable distances. Basal channel deposits are often grouped with tabular or rollfront deposits, depending on their unique characteristics. The model for formation of palaeochannel deposits is similar to that for roll-front deposits, above, except that the source of uranium may be in the watershed leading into a stream, or the bed load of the palaeochannel itself. This uranium is transported through the groundwaters and is deposited either at a reduced boundary, or in ephemeral drainage systems such as those in deserts of Namibia and Australia, it is deposited in calcretised evaporation sites or even in saline lakes as the ground water evaporates. Some particularly rich uranium deposits are formed in palaeochannels which are filled in the lower parts by lignite or brown coal, which acts as a particularly efficient reductive trap for uranium. Sometimes, elements such as scandium, gold and silver may be concentrated within these lignite-hosted uranium deposits. The Frome Embayment in South Australia hosts several deposits of this type including Honeymoon, Oban, Beverley and [Four-Mile] (which is the largest deposit of this class). These deposits are hosted in palaeochannels filled with Cainozoic sediments and sourced their uranium from uranium-rich Palaeo- to Mesoproterozoic rocks of the Mount Painter Inlier and the Olary Domain of the Curnamona Province. Tectonic-lithologic controlled uranium deposits occur in sandstones adjacent to a permeable fault zone which cuts the sandstone/mudstone sequence. Mineralisation forms tongue-shaped ore zones along the permeable sandstone layers adjacent to the fault. Often there are a number of mineralised zones 'stacked' vertically on top of each other within sandstone units adjacent to the fault zone. Quartz pebble conglomerate hosted uranium deposits are of historical significance as the major source of primary production for several decades after World War 2. This type of deposit has been identified in eight localities around the world, however the most significant deposits are in the Huronian Supergroup in Ontario, Canada and in the Witwatersrand Supergroup of South Africa. These deposits make up approximately 13% of the world's uranium resources. Quartz pebble conglomerate hosted uranium deposits formed from the transport and deposition of uraninite in a fluvial sedimentary environment and are defined as stratiform and stratabound paleoplacer deposits. Host rocks are typically submature to supermature, polymictic conglomerates and sandstones deposited in alluvial fan and braided stream environments. The host conglomerates of the Huronian deposits in Canada are situated at the base of the sequence, whereas the mineralized horizons in the Witwatersand are arguably along tectonized intraformational unconformities. Uranium minerals were derived from uraniferous pegmatites in the sediment source areas. These deposits are restricted to the Archean and early Paleoproterozoic and do not occur in sediments younger than about 2200 million years when oxygen levels in the atmosphere reached a critical level, making simple uranium oxides no longer stable in near-surface environments. Quartz pebble conglomerate uranium deposits are typically low grade but characterized by high tonnages. The Huronian deposits in Canada generally contain higher grades (0.15% U3O8) and greater resources (as shown by the Denison and Quirke mines), however some of the South African gold deposits also contain sizeable low grade (0.01% U3O8) uranium resources. In the Witwatersrand deposits ores are found along unconformities, shale and siltstone beds, and carbonaceous seams. The West Rand Group of sediments tend to host the most uranium within the Witwatersrand Supergroup. The uranium rich Dominion Reef is located at the base of the West Rand Supergroup. The Vaal Reef is the most uranium rich reef of the Central Rand Group of sediments. Structural controls on the regional scale are normal faults while on the deposit scale are bedding parallel shears and thrusts. Textural evidence indicates that the uranium and gold have been remobilized to their current sites; however the debate continues if the original deposition was detrital or was entirely hydrothermal, or alternatively related to high grade diagenesis. Uranium minerals in the Witwatersrand deposits are typically uraninite with lesser uranothorite, brannerite, and coffinite. The uranium is especially concentrated along thin carbonaceous seams or carbon leaders. Strong regional scale alteration consists of pyrophyllite, chloritoid, muscovite, chlorite, quartz, rutile, and pyrite. The main elements associated with the uranium are gold and silver. Gold contents are much higher than in the Elliot Lake type with U:Au ranging between 5:1 and 500:1, which indicates that these gold-rich ores are essentially very low grade uranium deposits with gold. Sedimentological controls on the Huronian deposits of the Elliot Lake district appear to be much stronger than in the Witwatersrand deposits. Ores grade from uranium through thorium to titanium-rich with decreasing pebble size and increasing distance from their source. While evidence of post-diagenetic remobilization has been identified, these effects appear far subordinate to the sedimentological controls. Ore consists of uraninite with lesser brannerite and thucholite. These occur in thin beds exhibiting graded bedding reminiscent of placer sorting. Alteration is nonexistent to very weak at best and the weak chlorite and sericite are believed to be mainly post-ore effects. Other post-depositional alteration includes pyritization, silicification, and alteration of titanium minerals. The most prominent geochemical associations with the uranium are thorium and titanium. It should be noted that this schematic model represents the original depositional setting. The Huronian underwent mild post-depositional folding during the Penokean orogeny around 1.9 billion years. The main regional structure is the Quirke syncline along the margins of which the majority of the known deposits are situated. Due to this structural overprint ore bodies range from subhorizontal to steeply dipping. Only one iron-ore-copper-gold (IOCG) deposit of this type is known to contain economically significant quantities of uranium. Olympic Dam in South Australia is the world's largest resource of low-grade uranium and accounts for about 66% of Australia's reserves plus resources. Uranium occurs with copper, gold, silver, and rare earth elements (REE) in a large hematite-rich granite breccia complex in the Gawler Craton overlain by approximately 300 metres of flat-lying sedimentary rocks of the Stuart Shelf geological province. Another example for the Breccia type is the Mount Gee area in the Mount Painter Inlier, South Australia. Uranium mineralised quartz-hematite breccia is related to Palaeoproterozoic granites with uranium contents of up to 100 ppm. Hydrothermal processes at about 300 million years ago remobilised uranium from these granites and enriched them in the quartz-hematite breccias. The breccias in the area host a low grade resource of about 31,400 t U3O8 at 615 ppm in average. 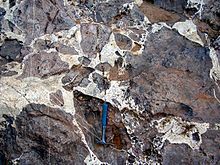 Vein deposits play a special role in the history of uranium: the term "pitchblende" ("Pechblende") originates from German vein deposits when they were mined for silver in the 16th century. F.E. 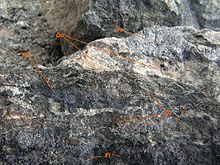 Brückmann made the first mineralogical description of the mineral in 1727 and the vein deposit Jachymov in the Czech Republic became the type locality for uraninite. In 1789 the German chemist M. H. Klaproth discovered the element of uranium in a sample of pitchblende from the Johanngeorgenstadt vein deposit. The first industrial production of uranium was made from the Jachymov deposit and Marie and Pierre Curie used the tailings of the mine for their discovery of polonium and radium. Intragranitic veins form in the late phase of magmatic activity when hot fluids derived from the magma precipitate uranium on cracks within the newly formed granite. Such mineralisation contributed much to the uranium production of France. Veins hosted by metasedimentary units in the exocontact of granites are the most important sources of uranium mineralisation in central Europe including the world class deposits Schneeberg-Schlema-Alberoda in Germany (96,000 t uranium content) as well as Pribram (50,000 t uranium content) and Jachymov (~10,000 t uranium content) in the Czech Republic. Also they are closely related to the granites, the mineralization is much younger with a time gap between granite formation and mineralisation of 20 million years. The initial uranium mineralisation consists of quartz, carbonate, fluorite and pitchblende. Remobilsation of uranium occurred at later stages producing polymetal veins containing silver, cobalt, nickel, arsenic and other elements. Large deposits of this type can contain more than 1,000 individual mineralized veins. However, only 5 to 12% of the vein areas carry mineralization and although massive lenses of pitchblende can occur, the overall ore grade is only about 0.1% uranium. The Bohemian Massif also contains shear zone hosted uranium deposits with the most important one being Rozna-Olsi in Moravia northwest of Brno. Rozna is currently the only operating uranium mine in central Europe with a total uranium content of 23,000 t and an average grade of 0.24%. The formation of this mineralisation occurred in several stages. After the Variscan Orogeny, extension took place and hydrothermal fluids overprinted fine grained materials in shear zones with a sulfide-chlorite alteration. Fluids from the overlying sediments entered the basement mobilising uranium and while uprising on the shear zone, the chlorite-pyrite material caused precipitation of uranium minerals in form of coffinite, pitchblende and U-Zr-silicates. This initial mineralisation event took place at about 277 million to 264 million years. During the Triassic a further mineralisation event took place relocating uranium into quartz-carbonate-uranium veins. Another example of this mineralisation style is the Shinkolobwe deposit in Congo, Africa, containing about 30,000 t of uranium. Intrusive deposits make up a large proportion of the world's uranium resources. Included in this type are those associated with intrusive rocks including alaskite, granite, pegmatite and monzonites. Major world deposits include Rossing (Namibia), Ilimaussaq intrusive complex (Greenland) and Palabora (South Africa). Marine sedimentary phosphorite deposits can contain low grade concentrations of uranium, up to 0.01–0.015% U3O8, within fluorite or apatite. These deposits can have a significant tonnage. Very large phosphorite deposits occur in Florida and Idaho in the United States, Morocco, and some middle eastern countries. Collapse breccia pipe deposits occur within vertical, circular solution collapse structures, formed by the dissolution of limestone by groundwater. Pipes are typically filled with down-dropped coarse fragments of limestone and overlying sediments and can be from 30 to 200 metres (100 to 660 ft) wide and up to 1,000 metres (3,300 ft) deep. Primary ore minerals are uraninite and pitchblende, which occur as cavity fills and coatings on quartz grains within permeable sandstone breccias within the pipe. Resources within individual pipes can range up to 2500 tonnes U3O8 at an average grade of between 0.3 and 1.0% U3O8. The best known examples of this deposit type are in Arizona, USA, where several of these deposits have been mined. Volcanic deposits occur in felsic to intermediate volcanic to volcaniclastic rocks and associated caldera subsidence structures, comagmatic intrusions, ring dykes and diatremes. Mineralization occurs either as structurally controlled veins and breccias discordant to the stratigraphy and less commonly as stratabound mineralization either in extrusive rocks or permeable sedimentary facies. Mineralization may be primary, that is magmatic-related or as secondary mineralization due to leaching, remobilization and re-precipitation. The principal uranium mineral in volcanic deposits is pitchblende, which is usually associated with molybdenite and minor amounts of lead, tin and tungsten mineralization. Volcanic hosted uranium deposits occur in host rocks spanning the Precambrian to the Cenozoic but because of the shallow levels at which they form, preservation favors younger age deposits. Some of the more important deposits or districts are Streltsovskoye, Russia; Dornod, Mongolia; and McDermitt, Nevada. The average deposit size is rather small with grades of 0.02% to 0.2% U3O8. These deposits make up only a small proportion of the world's uranium resources. The only volcanic hosted deposits currently being exploited are those of the Streltsovkoye district of eastern Siberia. This is in fact not a single stand-alone deposit, but 18 individual deposits occurring within the Streltsovsk caldera complex. Nevertheless, the average size of these deposits is far greater than the average volcanic type. Surficial deposits are broadly defined as Tertiary to Recent near-surface uranium concentrations in sediments or soils. Mineralization in calcrete (calcium and magnesium carbonates) are the largest of the surficial deposits. They are interbedded with Tertiary sand and clay, which are usually cemented by calcium and magnesium carbonates. Surficial deposits also occur in peat bogs, karst caverns and soils. Surficial deposits account for approximately 4% of world uranium resources. The Yeelirrie deposit is by far the world's largest surficial deposit, averaging 0.15% U3O8. Langer Heinrich in Namibia is another significant surficial deposit. Metasomatite deposits consist of disseminated uranium minerals within structurally deformed rocks that have been affected by intense sodium metasomatism. Ore minerals are uraninite and brannerite. Th/U ratio in the ores is mostly less than 0.1. Metasomatites are typically small in size and generally contain less than 1000 t U3O8. Giant (up to 100 thousands t U) U deposits in sodium metasomatites (albitites) are known in Central Ukraine and Brazil. metasomatized granite; ex. Ross Adams deposit in Alaska, United States, Novokostantynivka deposit in Kirovogradska oblast, Ukraine. metasomatised metasediment; ex. Zhovta Richka and Pervomayske deposits in Dnipropetrovska oblast, Ukraine and Valhalla deposit in northwestern Queensland, Australia. Metamorphic deposits those that occur in metasediments or metavolcanic rocks where there is no direct evidence for mineralization post-dating metamorphism. These deposits were formed during regional metamorphism of uranium bearing or mineralized sediments or volcanic precursors. The most prominent deposits of this type are Mary Kathleen, Queensland, Australia, and Forstau, Austria. Lignite deposits (soft brown coal) can contain significant uranium mineralization. Mineralization can also be found in clay and sandstone immediately adjacent to lignite deposits. Uranium has been adsorbed onto carbonaceous matter and as a result no discrete uranium minerals have formed. Deposits of this type are known from the Serres Basin, in Greece, and in North and South Dakota in the USA. The uranium content in these deposits is very low, on average less than 0.005% U3O8, and does not currently warrant commercial extraction. Black shale mineralisations are large low-grade resources of uranium. They form in submarine environments under oxygen-free conditions. Organic matter in clay-rich sediments will not be converted to CO2 by biological processes in this environment and it can reduce and immobilise uranium dissolved in seawater. Average uranium grades of black shales are 50 to 250 ppm. The largest explored resource is Ranstad in Sweden containing 254,000 t of uranium. However, there are estimates for black shales in the US and Brazil assuming a uranium content of over 1 million tonnes, but at grades below 100 ppm uranium. The Chattanooga Shale in the southeastern USA for example is estimated to contain 4 to 5 million tonnes at an average grade of 54 ppm. Because of their low grades, no black shale deposit ever produced significant amounts of uranium with one exception: the Ronneburg deposit in eastern Thuringia, Germany. The Ordovician and Silurian black shales at Ronneburg have a background uranium content of 40 to 60 ppm. However, hydrothermal and supergene processes caused remobilsation and enrichment of the uranium. The production between 1950 and 1990 was about 100,000 t of uranium at average grades of 700 to 1,000 ppm. Measured and inferred resources containing 87,000 t uranium at grades between 200 and 900 ppm are left. There are also uranium deposits, of other types, in the Jurassic Todilto Limestone in the Grants District, New Mexico, USA. The Freital/Dresden-Gittersee deposit in eastern Germany produced about 3.700 t of uranium from Permian hard coal and its host rocks. The average ore grade was 0.11%. The deposit formed in a combination of syngenetic and diagenetic processes. In some countries like China trials are underway to extract uranium from fly ash. Wikimedia Commons has media related to Geology of Uranium. ^ "Cameco – Uranium 101". Retrieved February 1, 2009. ^ "Cameco – Uranium 101, Where is uranium found?". Retrieved 2009-01-28. ^ "Uranium". Los Alamos National Laboratory. Retrieved 2009-02-11. ^ "WorldBook@NASA: Supernova". NASA. Archived from the original on 2006-09-30. Retrieved 2009-02-11. ^ "Mineralogy Database". Retrieved March 25, 2009. ^ a b c d e f g h i j k l m "Geology of Uranium Deposits - World Nuclear Association". world-nuclear.org. Retrieved 18 April 2018. ^ "Page not found". www.allianceresources.com.au. Archived from the original on 13 March 2017. Retrieved 18 April 2018. ^ "AGM Presentation by MD Mr Patrick Mutz". allianceresources.com.au. Retrieved 18 April 2018. ^ "Marathon Resources Ltd – Paralana Mineral System (Mt Gee)". Archived from the original on 2009-04-10. Retrieved 2009-04-22. ^ Ruzicka, V. (1993). "Vein uranium deposits". Ore Geology Reviews. 8: 247–276. doi:10.1016/0169-1368(93)90019-U. ^ "Out of the Ashes". Dahlkamp, Franz (1993). Uranium Ore Deposits. Berlin, Germany: Springer-Verlag. ISBN 3-540-53264-1. "Geoscience Australia Uranium factsheet" (PDF). Archived from the original (PDF) on 2007-09-11. Retrieved 2007-08-14. "Uranium Ore Deposits". WISE Uranium Project. Retrieved 2008-09-20. This page was last edited on 2 March 2019, at 03:20 (UTC).